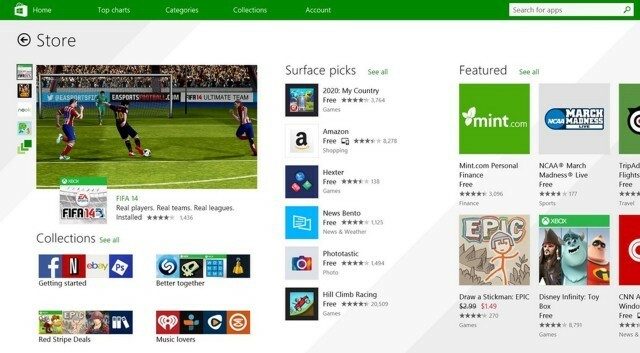 Microsoft has published its Windows and Windows Phone Store statistics for the month of April 2014 on the Most downloaded apps by category, country and markets. The stats aim to give developers a better idea what the “app ecosystem” needs developed and what consumers are more likely to purchase. The statistics show that the US is still Microsoft’s largest market for Windows 8 and Windows Phone apps with the former boasting more downloads. In fact, 31% of the Windows Store downloads originate from the US. As far as Windows Phone Store downloads are concerned, 12% come from the US, 10% from China, 9% from India and, lastly, Vietnam stands at 8%. The most popular category in both stores is Games, but surprisingly, it doesn’t boast the highest downloads per app ratio. Microsoft uses this term to represent a function of total downloads against total available apps in the certain category. The Social app category is the one that has the highest downloads per app ratio, followed by Photos. The company states that Productivity and Games are some of the categories that represent a high opportunity for revenue to developers. Follow the source link for some interesting graphs, if you’re interesting in how the Windows Phone store has been doing lately.